This was supposed to be a trip from Detroit to Rochester, and was originally supposed to be part of a round trip booking ex-Bengaluru. A lot of circumstances changed, and I ended up having to book a Bengaluru-Detroit-Bengaluru ticket, and then book my trip to Rochester, which was my final destination, seperately. I thought to booking a Detroit-Rochester round trip ticket, saving some money in the process - but then the only airline that flew direct turned expensive even as a round trip, and it appeared economical to book them seperately. I finalised my plans and was all set to book, when my host in Findlay, OH calls one morning, and informs that I should be booking out of Columbus and not Detroit! At the first sight, I did not quite recognize my bag! I had always thought it was blue, but it turned to be black! May be I was too excited, or I was hallucinated by the lack of sleep. It was almost 0100hrs back in India and I hadn't slept much in the last 40 hours! There was a helluva long queue to get past Customs - and crew of an incoming flight from the middle east were allowed to cut the line as well. Customs officials just collected the declaration form and let me go. As I walked towards the exit, United agents, who were everywhere, asked if I was taking a United flight, and took my check-in baggage. It was cold, and I felt it, as I walked out of the confines of the Boeing 747-830. I paused to put on my jacket, and then continued through the jetway. As I went up a level, Lufthansa agents stood around holding placards with names of connecting flights - Detroit, San Francisco, etc. They took care of all the passengers who had short connections, while there were more agents a little away who directed passengers with long connections to their gates. 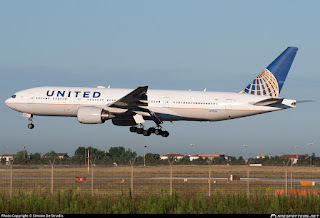 I stopped by one of the agents to get my gate - my connecting flight - United 906 - would depart from "Zee Sixteen", she repeated once again for me - "Zed One Six". She indicated it was a long walk - it indeed was.